I write this a day after Day 5. 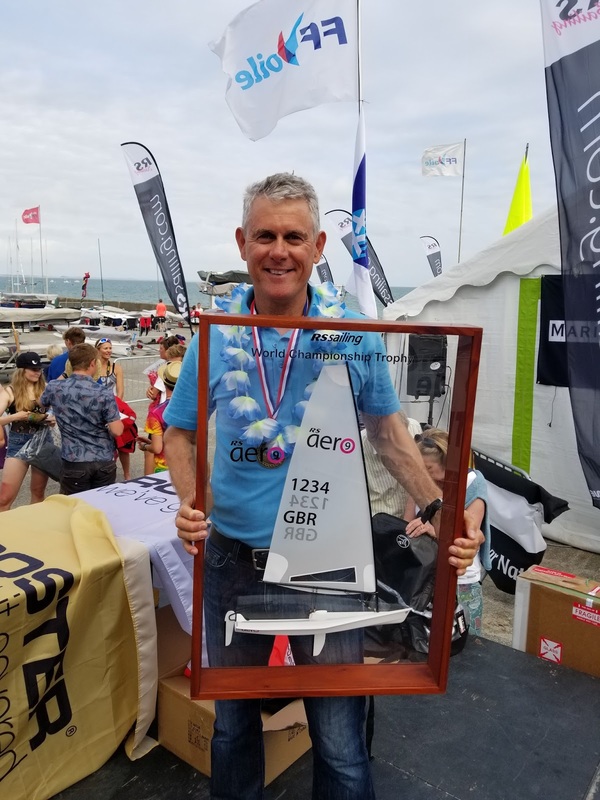 It's all been a bit of whirlwind, but am sitting in the Rennes airport about to embark on a few days of relaxation, so there's time to finish out the regatta report. I'd been up until 1:30am doing a price analysis for a client (my "real" job is selling residential real estate in Connecticut) and writing Day 4's blog. On top of that, Day 5's racing was to start two hours earlier than usual. Of course I awoke well before the alarm, meaning I'd only had 5.5 hours of sleep. To say I was dragging is an understatement! The forecast was for a southwesterly flow at about the same velocity as the prior four days. Gerard Vos from the Netherlands hooked up his GoPro to the back of my Aero using an ingenious suction mounting system, explained how to start the camera and I was off. First thing that happened? A wave bounced the boat up then DOWN, causing the daggerboard to hit the concrete ramp with an expensive-sounding CRUNCH! "There goes the security deposit" I thought while sailing out the harbor and once more into the choppy bay. Pre-race homework was done again, but with little gusto. The breeze seemed a bit lighter than usual, but then built up to the normal 12 or so by the start, eventually building to 15+. 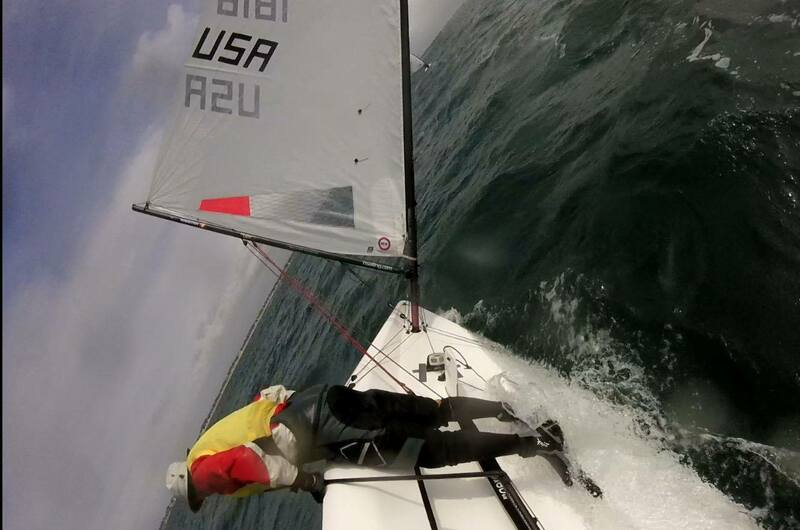 My goals were to sail clean, stay close to 2nd place Liam Willis of GBR, and get 'er done. The race committee signaled a triple-quadrilateral course, same as the first day--lots of downwind sailing ahead! The port side of the line was favored and the cool kids were down there. Liam lept out furthest to leeward. I had Madhavan Thirumalai (USA) just to leeward of me, who was doing a fine job of sailing high initially. I put the boat into Jacobi-patented HiMode and worked up off his hip, and when far enough to windward put the bow down a bit and moved slightly forward. We'd started in a lift, but after a minute or two the breeze moved slightly left. Liam took the opportunity to cross the fleet, but I thought it a bit premature. Sailed another minute or so on starboard before flicking over in more pressure and angle for a long sail back to the middle. Liam had a *lot* of leverage off to the right, but the lefty was holding. About 2/3 up the beat he tacked back to the middle and it looked like I might have him, but then the lefty began a slow collapse and the angles tilted to Liam's favor--it was going to be close! When we finally met near the top I did a sloppy duck (rudder was fully stalled out--scary!) and went for the starboard tack layline. In what had now become a starboard-tack lift, I tacked on the layline. Liam had to do two tacks to get up to me, eating a header on port to do so, and fell 5 boatlengths back as I flew around Mark 1 in first. Ahead on the first reach were tail-enders of the 7 fleet. I went low, thinking I could sail through them and not disturb, but they were surprisingly quick and ended up affecting MY speed, especially in the latter third of the leg. This allowed the fast-reaching Liam to gain quite a bit of ground and eventually pass me near Mark 2. He slowed waaay down just before/during the rounding, and I got right on his transom. We both gybed onto port, and I surfed low to Mark 4, while he sailed his typical, slightly-higher reaching course. Did you notice anything? Yeah, Mark 4. The next mark was supposed to be *3. * We were still sailing like it was a triangle course! About 1/4 down the leg we both realized the error and gybed back out to 3. I actually had a very nice angle to the mark and extended, finally passing those pesky 7s. Also managed to sail low and fast to the next mark and pulled out to a tidy 7 length lead after rounding Mark 4. The next beat was a long port-tack procession to the right in a very steady, slight lefty. 17-year-old Liam showed tremendous maturity staying on the favored tack, keeping the pressure on instead of taking a flyer to the left. Others tried it and fell well back. Feeling so drained, I was happy to not have a lot of tacking to do. LOL We stayed in similar positions for the next lap around the quadrilateral, and I managed to pull away by sailing lower yet maintaining pace on the slightly broad, and therefore technical, second reaches. letting the sheet way out and leaning as far over the port side as possible to fend off the inevitable (Liam confessed later this was the break he had been hoping for!) Somehow I managed to avoid flipping, turned the boat back up to dead downwind and furiously pulled in the sheet again to stabilize the boat. I'd lost some distance, but still had a comfortable lead at the finish. I'd won the race, and the World Championship!! Liam generously offered his congratulations, as did 3rd place finisher Greg Bartlett. I mentioned that I was heading in early, and they were somewhat surprised. It can be considered bad form to not sail all races in a regatta when one doesn't technically need to. Kinda like "I've won, I'm done here" mindset. 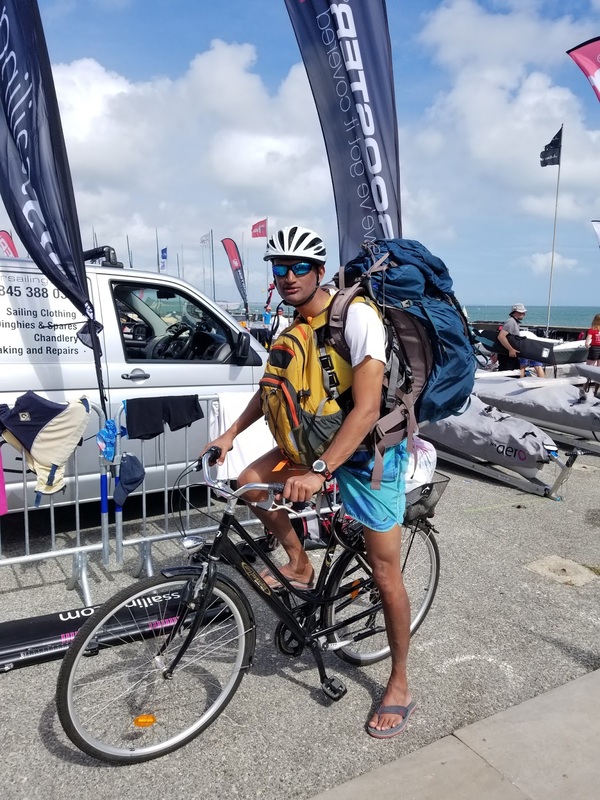 I had an entirely different reason for skipping the last two (beside being exhausted): my training partner and friend Madhavan Thirumalai had offered to take my sailing gear back to the US so I could continue my European adventure without lugging around another piece of luggage. I wanted to have my gear clean and dry so it would be of as little bother as possible. As it was, Madhavan had quite the backpack to take with him--thank you buddy! Have to say, it was nice arriving at the ramp without a lot of traffic. De-rigged and washed the boat, then just chilled until the fleet's return. We loaded up the charter boats onto a huge trailer, and I had enough time to head back to the room for a shower (the club's drain had a nasty clog that was stinking up the place--bleh!). My name will be the first on it! The award presentation was festive! After we took photos, the stretching gang (a number of young sailors and I) got together one last time, then we retreated to the tents where regatta sponsor Ron Abuelo was pouring delicious rum drinks. Melissa and David Solnick invited a few of us to their place for dinner, where Melissa and Doug DuBois put together a delicious spread. 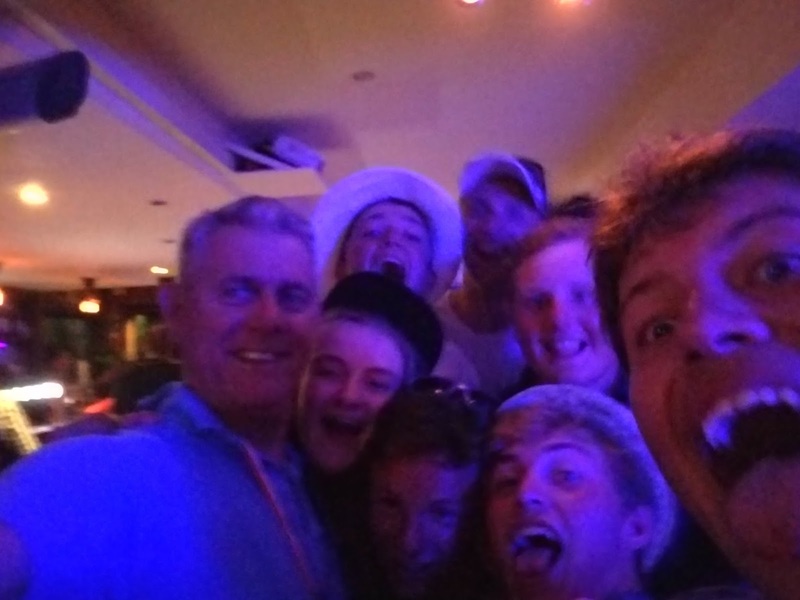 At 11pm International Class Manager Peter Barton, Junior from RS and I ventured into town to join fellow Aero sailors at a local bar, where the partying was well underway! Legal drinking age in France is 16, and several of the kids were taking full advantage... lol It was a joyful, celebratory evening with new friends and old. 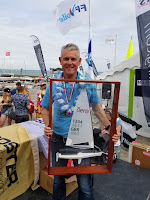 The very first RS Aero World Championship had gone off with little incident, 96 sailors enjoying superb conditions, excellent race committee work, and fabulous camaraderie! Congratulations sir. And thanks for all the excellent blog posts. Enjoy the rest of your European vacation. Marc, you have really set us the standard in the 9-rig. I am so motivated to give you a better run for your money at the next worlds in Weymouth. Huge congratulations on your victory this year, us Brits will be back on your case next time around. You are going to have to guide us on how you Hi and Lo mode in due course. Have a great few days in Barcelona.